The most common cause of autonomic dysreflexia (AD) is spinal cord injury. 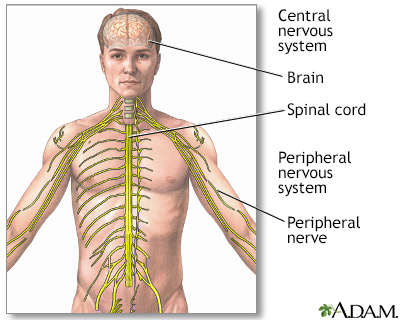 The nervous system of people with AD over-responds to the types of stimulation that do not bother healthy people. Sometimes there are no symptoms, even with a dangerous rise in blood pressure. The health care provider will do a complete nervous system and medical examination. Tell the provider about all the medicines you are taking now and that you took in the past. This helps determine which tests you need. AD is life threatening, so it is important to quickly find and treat the problem. Proper treatment depends on the cause. If medicines or illegal drugs are causing the symptoms, those drugs must be stopped. Any illness needs to be treated. For example, the provider will check for a blocked urinary catheter and signs of constipation. If a slowing of the heart rate is causing AD, drugs called anticholinergics (such as atropine) may be used. Very high blood pressure needs to be treated quickly but carefully, because the blood pressure can drop suddenly. A pacemaker may be needed for an unstable heart rhythm. Outlook depends on the cause. People with AD due to a medicine usually recover when that medicine is stopped. When AD is caused by other factors, recovery depends on how well the disease can be treated. Complications may occur due to side effects of medicines used to treat the condition. Long-term, severe high blood pressure may cause seizures, bleeding in the eyes, stroke, or death. Call your provider right away if you have symptoms of AD. To prevent AD, DO NOT take medicines that cause this condition or make it worse. Cowan H. Autonomic dysreflexia in spinal cord injury. Nurs Times. 2015;111(44):22-24. PMID: 26665385 www.ncbi.nlm.nih.gov/pubmed/26665385. McDonagh DL, Barden CB. Autonomic dysreflexia. In: Fleisher LA, Rosenbaum SH, eds. Complications in Anesthesia. 3rd ed. Philadelphia, PA: Elsevier; 2018:chap 131.